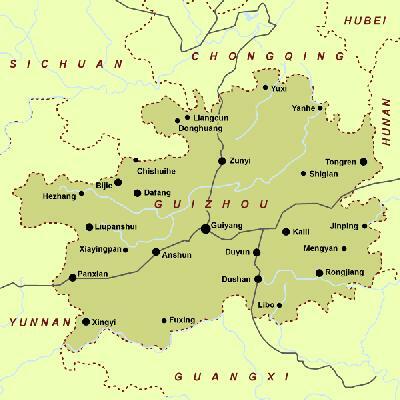 Guizhou Province, a province with many ethnic groups on the eastern section of the Yunnan-Guizhou Plateau in southwestern China, has an area of more than 170,000 square kilometers. It is situated 103'37"-109'32" east longitude and 24'37"-29'13" north latitude. Owing to folds, faults and erosion, the plateau is intersected with mountains, hills, basins and valleys, giving it a very rugged topography. 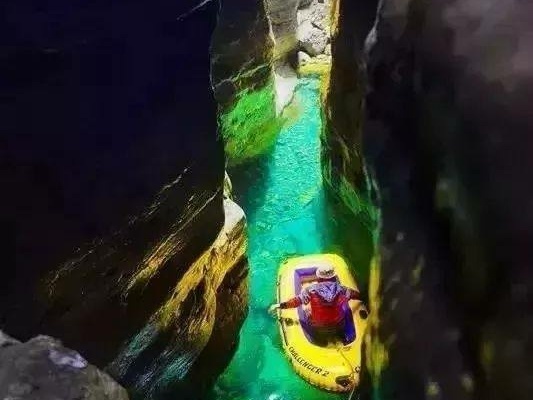 In many areas, limestone is found with numerous caverns and underground streams. Guizhou has a humid, sub-tropical monsoonal climate with warm winters, mild summers and unclear seasonal contrasts. It has a mean annual temperature of 14?ã­±6oC, and a mean annual precipitation of 1,100-1,400 mm. It has more overcast days than any other part of the country, the area around Guiyang averaging 220 cloudy days a year. It is divided into 4 prefecture-level cities, 2 districts, 3 autonomous prefectures, 9 county-level cities, 56 counties, 11 autonomous counties and 2 special zones, with a population of 35.25 million as of 2000, mainly including ethnic groups of Han, Miao, Bouyei, Dong, Yi, Shui, Hui, Gelo, Zhuang, Yao, Manchu and Bai. Guizhou Cuisine is characterized as spicy and savory. Special dishes include noodles with intestines, Yelang dough fish, Tangyuan (dumplings made of glutinous rice flour), and steamed (or fried) glutinous rice paste wrapped in lotus leaves, etc. Qian Opera, Huadeng (Flower Lantern) Opera, operas of Dong and Bouyei ethnic minorities. In the fields of agriculture and by-products, there are mainly paddy rice, maize, rapeseed, tobacco; and the outputs of tung oil, oil tea, Chinese Tallow, raw lacquer, tea and traditional Chinese medicinal materials have occupied a predominant position in the domestic market. In the field of industries, priorities are given to the development of iron and steel, coal, metallurgy, chemical, machinery, electricity, cigarette and papermaking industries.